The Single Feather is a novel that takes an unflinching look at what it is like to be disabled in modern Britain and it doesn’t shy away from confronting the big issues. Rachel is paralysed from the waist down; she has recently escaped a terrible situation and has moved into an adapted home in a small town. She is trying to come to terms with the new reality of her life and eventually joins a local art class in an attempt to meet some new people and to make friends. This book was a difficult read for me at times, but it’s an important read at the same time. Hunt doesn’t shy away from showing the very real prejudices that disabled people still experience. The way that Rachel was treated by the guards was extreme but it made a very important point about the lack of care given to disabled people at times and the lack of dignity that is so often a common experience. Likewise, with the words that some of the people in the art group used. Anne always referred to Rachel as handicapped, and Rachel felt uncomfortable explaining that disabled is a more socially acceptable word. Hunt cleverly distinguishes between the genuine malice in the way Rachel was treated in the past, and how often some people just don’t realise that the terms they are using are offensive. It doesn’t make it alright but there is a big difference between ignorance and intolerance and I’m glad this was shown in this novel. This is a novel that starts off quite slowly but Hunt gradually builds it up and it really comes into it’s own as you get a bit further into it. Once the back story of the characters starts to come through, you begin to understand their struggles and their motivations. The way they had behaved earlier in the novel began to make sense and it became possible to have real sympathy and understanding for them. Hunt never shies away from the realities of disability or mental health, and in this novel she really demonstrates that old adage about how everyone is fighting their own battle, you just might not know it. Hunt really does give you something to think about. I wish the reveal about what really caused Rachel’s disability had come earlier in the novel as when it eventually is revealed it allows us to understand so much more about who she is, and perhaps would’ve have given the earlier parts of the novel a bit more depth. Having said that, I do completely understand how difficult it is to explain, for many reasons, what your disability is and what caused it so it does make sense that Rachel felt such reticence to be open. I really enjoyed Kate and Rachel’s budding friendship, and as this became a closer friendship and we got to know more about them both it really added to the novel. I think Kate became my favourite character, she was well-adjusted and had the strength to speak out when necessary. There was much more introspection as the novel neared its end and I found some of it very powerful. The part where Rachel finally understands what her mum meant by it being her own views that needed changing, was striking. The idea that sometimes, as a disabled person, it is easy to sometimes assume that the whole world is automatically going to be against you because of how some people have treated you in the past. Once Rachel opened up about the past and began to share with select members of the group they all had a new-found respect and a deeper connection with her. Kate’s words of wisdom stuck out the most for me though when she was trying to get Rachel to understand that just because people don’t always mention her wheelchair or her disability it doesn’t automatically mean they’re feeling awkward about it; sometimes people see the person first and the disability and the wheelchair fade away because they’re not important. These words had such resonance for me and I’m going to be taking Kate’s advice on board in my own life. Ultimately, what really shines out of this novel is its representation of disability and mental health; how it shows a young woman doing her best to find a new normal and who is getting on with her life in spite of her disability, and there are very, very few books, if any, that show this. I rate this novel 4 out of 5 stars. 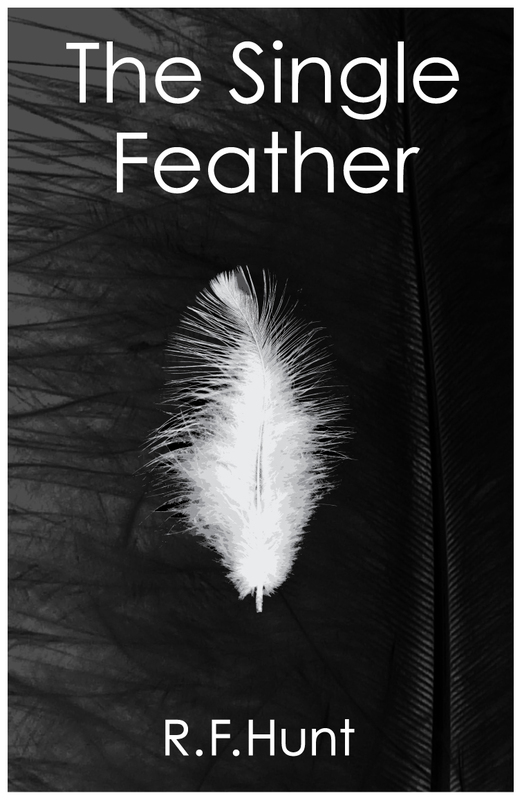 The Single Feather is out now and available from Amazon. This entry was posted in Books, ebooks, Read 2015, Review and tagged Book Review, Books, ebooks, Fiction, R. F. Hunt, Read 2015, Review. Bookmark the permalink. I really appreciate your review of this book, it’s certainly one I’d like to read. ‘Disability’ themes are interesting to me as I’m mobility impaired too. Thank you. I think you’d probably get quite a lot from this novel, in a similar way that I did. It’s very rare to read a novel that really takes an honest look at the realities of being disabled. Thank you do much, Hayley, and also many thanks to Oscar for your comments! You’re very welcome! Thank you for writing this novel. This sounds like an interesting if hard read. I think being be to raise awareness of disabilities is so important and doing it in a creative way can only help. It’s very rare to read a book that has a disabled main character so I hope this book finds a wider audience because, as you said, it helps raise awareness. It’s a great read aside from that too, all of the characters are fascinating and it’s interesting to see how they all interact with each other.